These are my “oldest” friends, actually they prefer to be called “forever” friends. We have been playing together since we were thirteen years old; naturally bright and pink and glowing and are still playing the beauty game all these years later. The rules and the products are different now and it takes longer, but the beautiful part is that we still have each other to laugh and share secrets, just like when we were kids. The one thing we all agree upon is that today, color is our secret weapon and “think pink” is our mantra. There is no way to get around the fact that when our skin looks tired, we look older. The surprising effect of the color pink is its ability to help us look 10 years younger… fifteen if we want to lie. Dealing with allergies and hormonal cycles, makes the appearance of dark circles more intense and the face falls to the floor… THINK PINK! 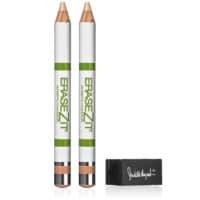 Use a pink or pinky beige concealer pencil or cream which will brighten your under eye area and help lift your face back up when you get an attack. To lift a tired, sallow complexion, we love the ritual of applying a subtle touch of pink blush right on the “apple” of the cheeks. 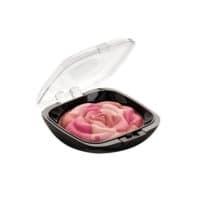 How to lift your face using ColorLift Beauty Blush – click here. For cooling and soothing tired, irritated and stressed eyes, the following tricks can be found right in your kitchen. Revitalize with cool veggie slices, cotton pads, or tea bags. Mother Nature knew what she was doing. Place thin chilled cucumber slices on eyelids for 10 min. The chill, coupled with the natural, mild astringency in cucumber juice soothes and gently tightens eye area. Place damp, chilled tea bags on your eyelids for 10 min. The tannin in tea has a lightly astringent effect on the skin. Black tea is best. Lie down and rest with tea bags on your closed eyes to calm skin and relieve puffiness. Place cotton pads soaked in water and witch hazel on eyelids for 10 min. This plant extract is a proven, classic anti-inflammation remedy – especially effective at soothing and reducing puffiness. Place thin discs of fresh, peeled potato on eyelids for 10 min. The natural potato “juice” easily absorbs heat from your skin, and provides a soothing, sensation for puffy or irritated lids. 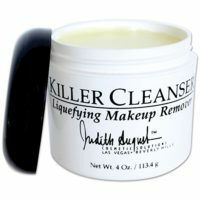 Whether it was in front of the camera, or everyday wear, for years, I have utilized a technique that helps softens fine lines and adds dimension to the face. It has always been one of my indispensable makeup tricks. I was delighted to find another guru, Vicki Fischer, who actually put a name to this simple, effective technique… Vicki’s Angel. As a makeup artist Vicki Fischer’s highlighting technique reminded her of an angel. 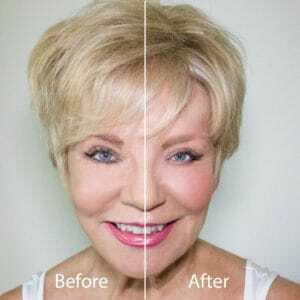 She thought “makeup application should be fun, so she started telling her clients that she was “lightening their face with a kiss from an angel” thus “Vicki’s Angel” came to be. 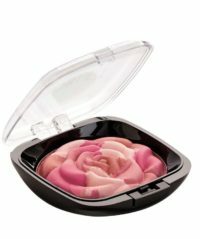 In order to give your face a “heavenly luminescence”. 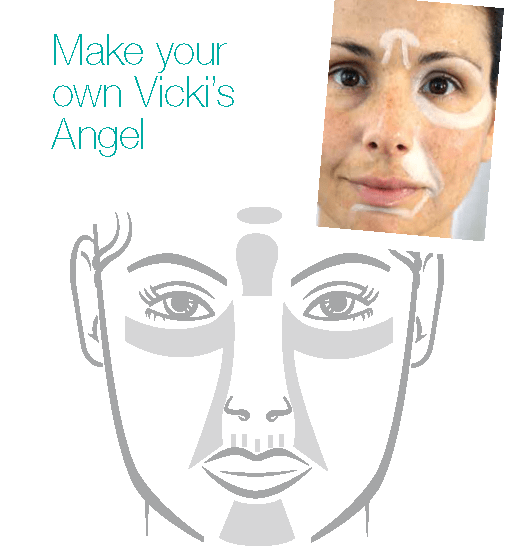 Vicki’s Angel both softens and lightens your appearance at the same time; helping to create the illusion of smoother skin. Tiny lip, frown and marionette lines all respond well to this technique. The Angel adds softness and dimension. It is a fun and easy way to remember a very important part of the makeup process. You will actually require less makeup by drawing an angel on your own face and it will extend the life of your makeup. 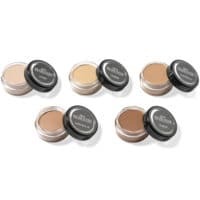 Use a concealer color one shade lighter than your foundation. 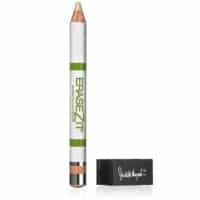 Apply with a small camouflage brush, eyeliner brush, or The Everything Pencil. Hold the skin taut and fill in the lines with the tip of your pencil or brush. 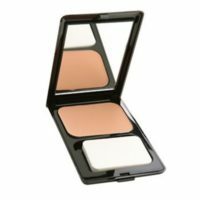 Be sure to press firmly into the lines as the concealer works like a filler. Think of it as putty. Take your middle finger and press in the concealer then feather out until it’s barely there. You will find that your fingers are great tools for blending your Angel. 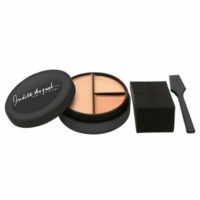 Carefully apply a thin layer of foundation over your entire face. Make sure you do not erase your angel. Let the illumination shine through. 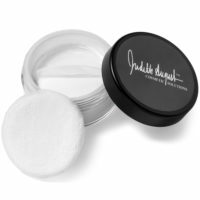 Apply loose translucent powder to set your makeup and eliminate shine using powder brush or puff. You will see how your angel lifts, lightens, and softens the lines on your face.